The midnight hour on December 11, 2011 brought a bright and vibrant halo around the Moon, not even 24 hours after its much-publicized total eclipse. It was all I could do to get my camera set up in time to snap a few photos; within the hour clouds rolled in and the effect was gone! 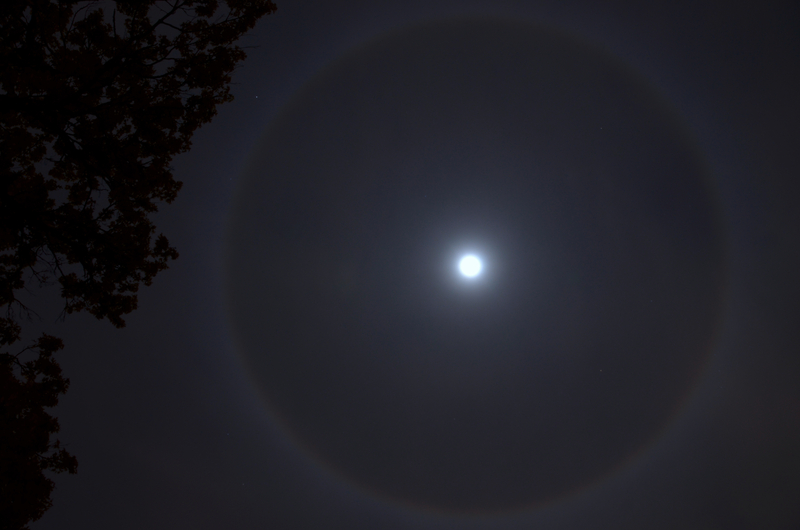 Caused by refraction of light in high-altitude ice particles, halos are most strongly observed (like this one) when the Moon is at zenith and are personally oriented for each particular observer, like rainbows. In other words, the halo you see around the Moon is literally for your eyes only! A great reminder to always look up… you never know what you’ll see in the skies above. Next Post Is Vesta a Planet Among Asteroids? I saw something similar in the garden last night, but since it was so cold and windy I thought it was just a trick of the tears streaming out of my eyes. Great pic.